According to the fancy blog tracker on my blog dashboard, it’s been about two years since my last post. I can’t say I’m surprised. Remember way back in August 2013 when I started this blog – which is the 3rd blog I’ve attempted in my life – that I said I was really bad a blogging? Now you know I didn’t lie to you. Two years ago, I was writing about healthy eating and exercise. I’m probably still going to write a lot about those things. I’m probably also going to write about family life, mental health, and mommy things. 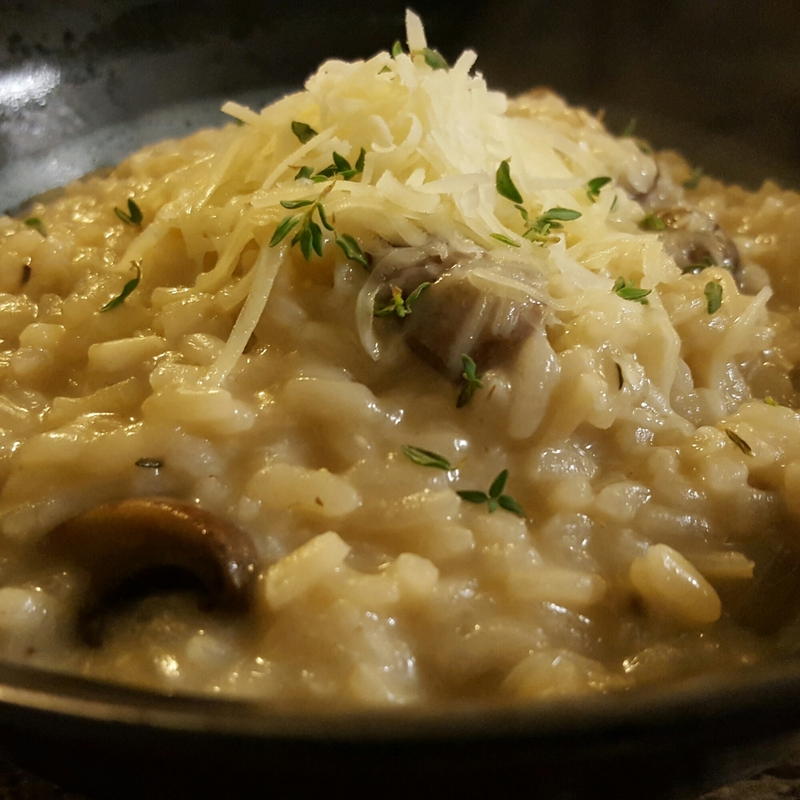 But really, none of that matters, because the name of this entry is “Mushroom Thyme Risotto”, so let’s stop talking about my lack of blogging skill and talk about FOOD!! If you’ve read any of my past entries, you’ll know that I adore food. My mom was a great cook, my grandma was a great baker, and I was a great watcher of Food Network in college. I love cooking and eating. But here’s what I don’t like to do: follow recipes. Ok. That was an over-reaction. It’s true, though, I don’t like to follow recipes (unless I’m baking, which is different). What I like to do is learn methods. I like to learn the science behind how a recipe works and then use that to make a million other things. In my blog, you’ll see a lot of method cooking. I’ll still post recipe along with it for those of you who are less confident cooking and measuring by guesstimation. I also don’t like spending money. So, more often than not, these recipes will be pretty doggone cheap. I also like good food. I am a big supporter of eating healthy. But I’m also a big supporter of food that tastes good! My recipes are always the best of both worlds. I do not follow a low-carb, low-fat, paleo, anything-free, or anything diet. I try to eat in moderation. This recipe is a bit heavier on the moderation scale. So I balance it with healthy choices throughout the day and maybe serve it with a salad. Now, without further ado, let’s talk risotto!! Risotto, in and of itself, is a method. You can make any kind of risotto you want. Just change the veggies, change the cheese, and BOOM! New risotto. Step one will be getting the correct rice. Now, this is the one budget splurge item of this dish. 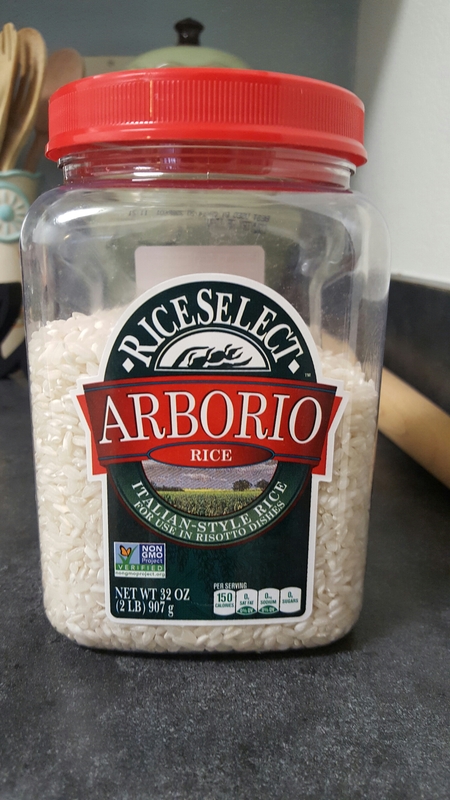 You MUST get Arborio rice. You cannot make risotto without Arborio rice. There’s a lot of science here, but it boils down to the amount of starch and the type of starch in the rice. Not all rices are created equally, and Arborio is the only one that will do for this dish. (Full disclosure: there are other types of risotto rice. I’m guessing they are much harder to find and more expensive than arborio.) I buy this big jug at my regular grocery store for around $10. It’s definitely more costly than your average rice, but I can get many nights of luxurious risotto from this package. Step two is gathering your other ingredients. In my case, I gathered mushrooms & thyme (duh) plus some aromatics of onions and garlic. I highly recommend keeping the onions and garlic, but you could substitute any veggie and herbs you’d like (or none at all). For risotto, I like my veg chopped fairly small. I like to dig in to the unctuous rice with a spoon, so I want everything to fit. Step three is heating your stock. The classic method of risotto making involves slowly adding ladles of stock into the rice. This works much better with hot stock. Use any stock you’d like. I default to chicken stock, but vegetable stock would totally work. I always heat up more stock than I think I need, and then just refrigerate any leftover. Step four…we RISOTTO! Crank up a pan – preferably a heavy bottomed wide pan with a good lip like this one – on medium high heat. Toss in a bit of butter AND olive oil. You could just do butter, but then you might burn it during the process (butter has a low smoke point). You could also just do oil, but then you don’t get the buttery goodness of butter. I do both! Once your pan is hot, toss in the onions and garlic for a couple minutes. This releases all that aromatic deliciousness we want from aromatics. Then, toss in your veg and herbs and sautee until mostly cooked. Make sure you add a good pinch of kosher salt! Now, the magic starts to happen. Melt in a just a little more butter (because, BUTTER) and throw in your magical Arborio rice. Stir a bit and let it soak up some buttery love and get a little toasty. Then – if you want to be very classic – pour in a little white wine. You don’t have to do this. You could just put in a ladle of stock. Either way, here we begin the real risotto process. Risotto does not cook like other rice. For our risotto, we want to the rice to release all its starchy goodness sloooooooooowly. That’s where our creamy goodness comes from. To do this, we must add liquid slowly. Add a ladle or two…stir until absorbed…repeat. Eventually, you’ll end up with creamy, al dente rice that you want to bury your face in. When you get close to the end (you’ll know, because it starts getting a really creamy consistency), start testing the rice. If it’s still crunchy, keep risotto-ing. Now, let’s take a break and talk about something. Risotto has a bit of a bad reputation. Some people think it takes too long. Some people think you must babysit it and stir it constantly. Neither of these things is true. Risotto takes about 20-30 minutes, depending on the size of your pan. And, really, you don’t HAVE to stir it constantly. You can add the liquid, stir it, walk away to do something else, come back and stir, add more liquid, stir it, etc, etc, etc. You can’t walk TOO far away, or for too long, but you certainly don’t have to stand at the stove the whole time (in fact, when I made this last, I managed to wash all our twins’ bottles from the day in the time between liquid additions). To finish off your risotto, I recommend tossing in a bit of cheese. You certainly don’t have to, though. The risotto is creamy enough all on its own. But…its cheese. Now all that’s left is dishing it up and shoveling it in your face. Easy, right? This is definitely a dish that looks and tastes gourmet, but it’s really very easy. So get out there and risotto!! 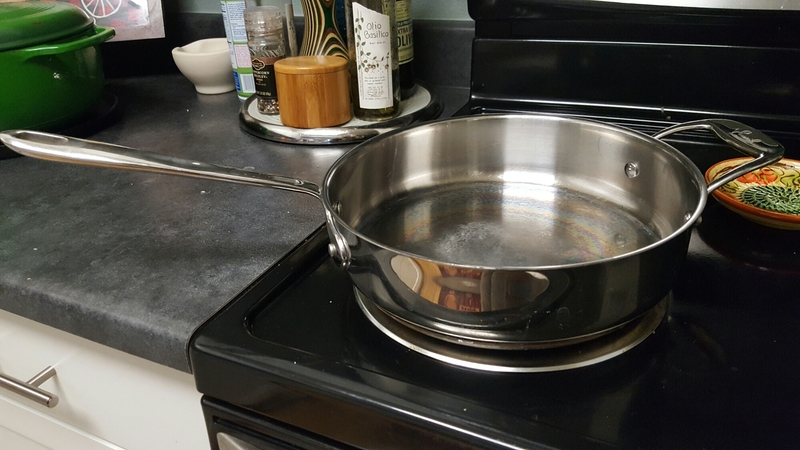 Preheat stock in a pot. Keep on low. Heat oil and 1 tbsp butter in a heavy-bottomed wide pan. Add onions and garlic. Sautee until translucent. Add mushrooms and thyme. Sautee until mushrooms are browned and give up some of their moisture. Add a good pinch of kosher salt. Add 1 tbsp butter and rice. Sautee rice for one minute. Add white wine OR add 1-2 ladles of stock. Stir. When rice has absorbed all the liquid, add 1-2 ladles of stock. Stir. Continue adding 1-2 ladles of liquid, stirring and allowing the rice to absorb all the liquid before adding more. When risotto beings to look creamy, test rice for doneness. If it is still crunchy, continue with liquid additions. Risotto is done when there is a creamy sauce and the rice is soft, but not mushy (you want it al dente, just like pasta). Add cheese, if desired, and stir in well. Serve with a little cheese on top and a sprinkle of thyme leaves.